To build the entremet use the Silikomart Symphony Mold Kit; pipe the Orange Passion Cream half way in the insert mold, freeze. Then pipe the Orange Passion Mousse on top and freeze. Using the large ring mold pipe the Yogurt Mousse in half way, unmold the insert and press inside, pipe some more mousse to the top; press inside the Crunchy Orange Streusel/ Almond Dacquoise that was cut with circle cutter from the Symphony Mold Kit; spread the Crunchy Orange Streusel on and freeze. 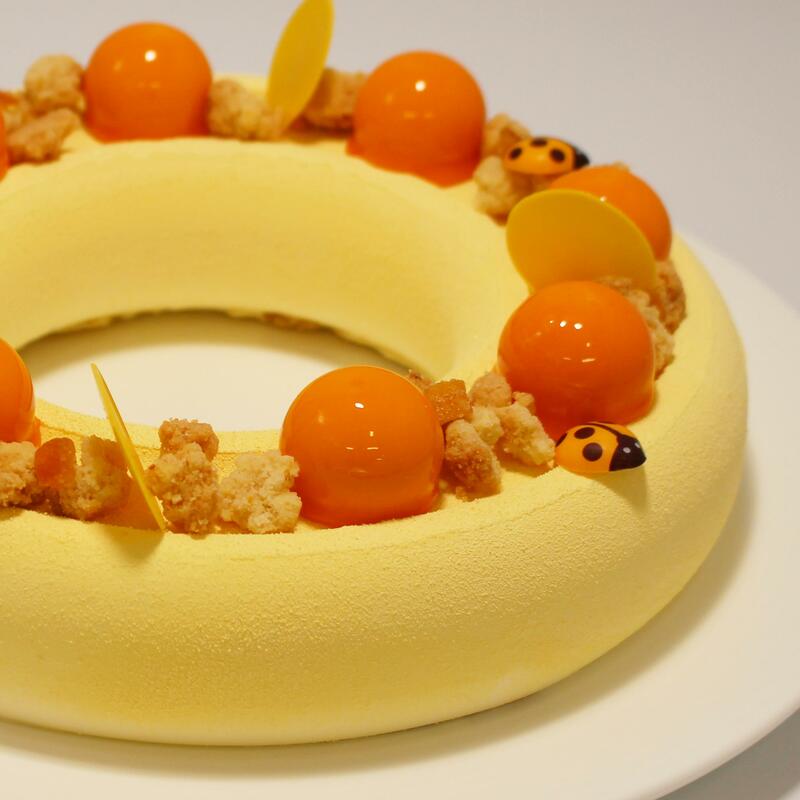 Unmold and spray with white chocolate velvet spray; Dip the Orange Passion Cream spheres in the Orange Shiny Glaze, place around the top of the entremet. Finish off with Orange Streusel, Yellow Chocolate Disc. Combine sugar, floour, salt, almond flour, and butter in the bowl of a stand mixer and paddle just until everything comes together. Sprinkle on to a parchment paper-lined sheet pan and refrigerate for 15 mins. Bake in a 320ºF/160ºC for 8-10 minutes or until lightly golden brown. Combine with the other ingredients and allow to set. Place some aside for garnish then with the remaining ingredients combine together. Sift together the powdered sugar and almond flour; add the orange rappe. In a mixer fitted with a whisk attachment, whip the egg whites and sugar to medium soft peak. Slowly fold the dry ingredients into the meringue and spread the batter onto parchment lined sheet pan. Sprinkle on top the chopped almonds. Bake at 350ºF/176ºC for 10-12 minutes or until done; allow to cool. Bloom the gelatin in cold water. Cook the sugar and the water to 247ºF/119ºC. Whip the egg yolks and then slowly pour in the hot syrup while the yolks are still whipping. Melt the gelatin and combine it with the Greek yogurt. Add lemon puree. Fold the yolk mixture into the Greek yogurt mixture, followed by the whipped cream.